Less mystery than character study, WETLANDS is of interest for it's cast who are allowed to shine. Akinnuoye-Agbaje is great as the brooding cop who is desperate to put together a winning hand. Heather Graham is great at his ex-wife in a performance that reminds us how good an actress she can be with the right part. The big treat here is Christopher Mcdonald as Akinnuoye-Agbaj's partner. Forever cast as goofy comic villains he makes a wonderful dramatic turn that let you know then there is more to him than we thought. 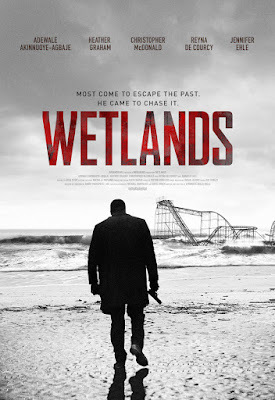 A solid little film, it it took me a bit to shake off the notion that this was going to be a hard driving noir (the write up and poster seemed to imply that) and instead that it as just the story of one man. Once the film clicked with me I went with it and it's moody rambles. I was entertained and moved. Definitely worth a look when the film opens Friday.